Morocco is renowned for its colors, with its cities awash in vivid shades of red, purple, green and gold. But things are a little different in Chefchaoen, a town in the northwest nestled among the Rif Mountains. Take a stroll through Chefchaoen’s streets and you’ll be hard-pressed to find something that isn’t painted a particular shade of blue. Chefchaoen, founded in 1471, was once a refuge of Jews and converted Christians of Muslim heritage. They sought refuge in the safety of these mountains after the Spanish Reconquista in medieval times, a period in which Christian kingdoms retook Muslim-controlled areas of the Iberian peninsula. 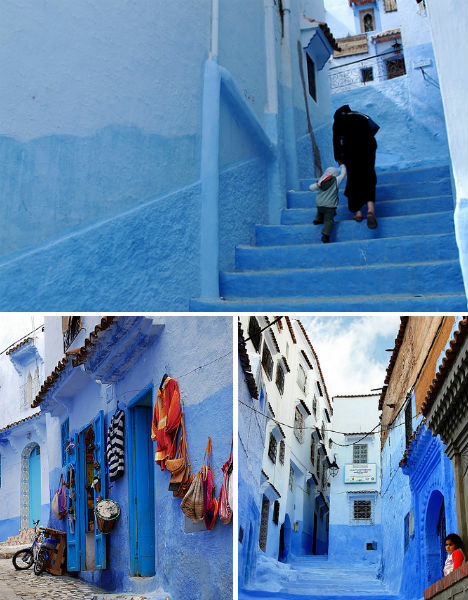 The town was painted the powder-blue of tekhelel, a natural dye made of shellfish. In the bible, Israelites are commanded to use this dye to color one of the threads of their prayer shawl. Though tekhelel is no longer available and the city’s population of Jews has diminished, the tradition has carried on through the centuries. 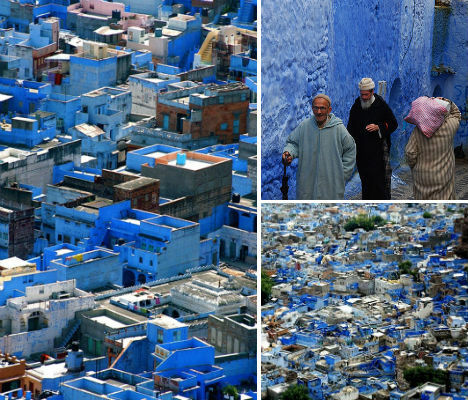 Blue pigment is sold in pots and bags throughout the city, and residents faithfully refresh the paint on their homes, flower pots, balcony railings, doors and practically everywhere else in the community. 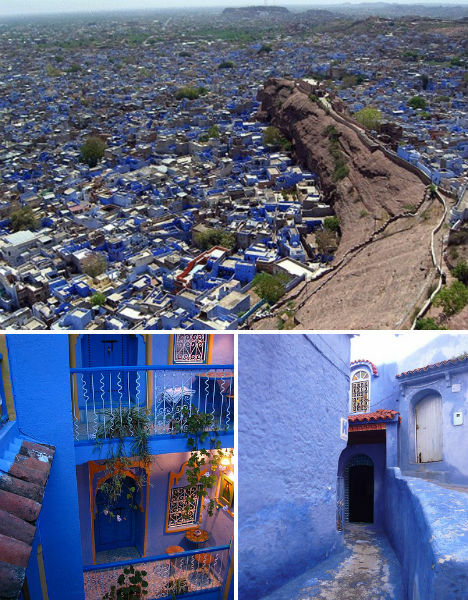 Even the interiors of many of these buildings are painted blue. The pigments may vary in color now, ranging from periwinkle to aqua, but the effect is no less spectacular, providing a monochromatic stage from which every other color dazzles, particularly the merchandise hung on walls outside of markets and shops. 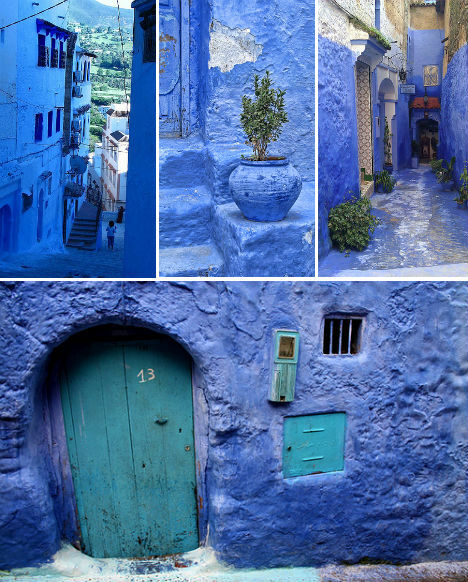 Of course, Chefchaouen is known for more than just its unique paint job. The city offers handicrafts that aren’t available in other areas of Morocco, such as wool garments and blankets, and is also one of the main producers of cannabis in the nation. It is often sold in great abundance at stands alongside fruits and vegetables. 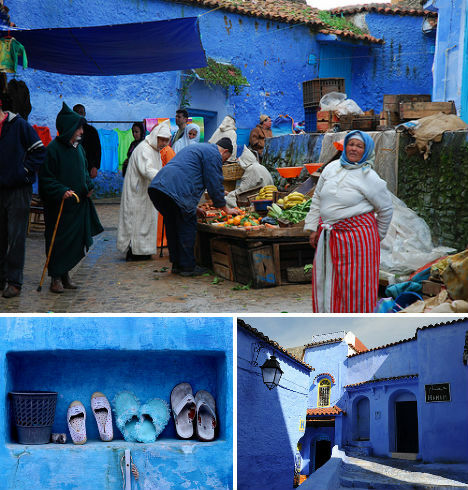 On holidays Chefchaouen is filled with tourists, especially the Spanish. Perhaps they’re making up for lost time, as the city was closed to European visitors until 1920.